Before I get into today’s thoughts on writing (which are mostly: yay, school’s back in session — I get to write again! ), I wanted to share some happy news. 1. Boarder Patrol was selected as one of the Canadian Children’s Book Centre’s “Best Books for Kids & Teens 2011.” Actually, I think I might have mentioned that in an earlier post. But I’m really, really happy about it, so please bear with me. 2. There’s a nice review of the SkinWalker books on the Keen Readers website (scroll down — it’s about the third or fourth from the top). 3. Next month will be my first time teaching a class for fellow writers. Gwynn Scheltema and I are teaming up to do an introductory course in writing for children, through Writescape. I’m getting excited about it. 4. Things are shaping up nicely on my two books due out next spring. I’ve had good feedback from both editors, and I’m about to plunge into revisions. I’ve even seen a sneak preview of one of the covers, but I don’t think I’m allowed to share it yet. Okay. On with the pending doom. 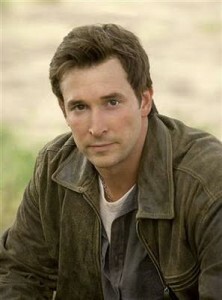 And the bonus picture of Noah Wylie. So it was with a certain amount of trepidation that I sat down to watch the first episode of Falling Skies with him. The premise: humans struggle to survive on post-alien-invasion Earth. Timeline is now-ish, and the star is Noah Wylie, as a history professor-turned-military advisor. He’s a father of three. Two of his sons are with him, one a risk-seeking soldier, one a child who’s crayon drawings will sucker-punch your soul before the opening credits have even aired. His middle son was captured by the aliens. And here’s the thing. I don’t want anything bad to happen to these people. I like Noah Wylie’s character. I want his kids to be safe. I want them to stroll into the alien camp and rescue his missing son (and hey, why not the other kids, too?) with nary a shot fired. I want a happy ending for all, but this is television. We all know the nature of dramatic writing; I doubt there are picnics and pancakes ahead. Conflict means tension, and tension means readers who keep the pages turning. Or, in this case, viewers who tune in for the next episode. So writers must provide conflict. More importantly: they must provide the possibility of conflict, different kinds of it. And then they must deliver. Two different things, both important. The thing is, the writers of this show have done a great job of making me care about the characters. I want to write them a polite note suggesting that they leave it at that: compelling people in an interesting situation. No need to separate the family further, or kill anybody off. I’m happy, honest! I’ll tune in again. In this case, the tension comes from the nature of the beast: I know that I’ve signed up to watch a story unfold. I know that when a story about aliens and guns and a post-apocalyptic future unfolds, bad things happen. Hunger Games fans, remember Rue? The writers and actors did the important part of the job: they made me care. They introduced a high-stakes situation. And now I’m feeling the tension in my belly that comes from knowing that this is a story. The medium itself is enough: it sets up the expectation that bad things will happen. And this doesn’t come from a cliffhanger or a hint of what’s coming or anything like that. This just comes from my knowing that it’s a story, and having expectations around that. When your reader picks up your book, they’re expecting things to happen. It’s what they signed up for. Leaving aside the obvious fact that you have to deliver on that expectation, you can take a certain satisfaction in knowing that the story-ness of your story is going to do some of the work for you. This ain’t your reader’s first rodeo, baby. They’re going to be imagining endings and possibilities and terrible fates with every turn of the page. Drop hints. Leave openings. Make the reader care about your characters, and let them wonder. Let them put themselves into that story and start writing it for you, a million different ways. That’s where the knotted-up feeling inside comes from. It’s why Hitchcock liked to leave the bad guys hidden. The more the reader brings to the story, the better. But here’s the trick: the story you write has to be as good as, or better than, the one the reader wrote in her head. I want everything to be all sunshine and rainbows for Noah Wylie and his fictional sons, but that’s not what I’m expecting. I’m thinking, first, that the gut-wrenchingest thing I would do as a writer would be to separate them. Put them all in danger, and leave the father wondering what’s happened to his sons. And go from there. I don’t know if that’s how the story will play out or not, but if it doesn’t, it better do something at least as compelling. Your readers have come to you for a roller coaster ride. They want to laugh and cry. Give them conflict. But first, give them a reason not to want it. Give them a reason to care about these people. They’ll tune in for more. Ooh, thanks for the tip about Falling Skies, Erin. I hope it doesn’t go the way of Firefly. I’m still keeping my fingers crossed that Torchwood hangs on. Also a show that’s great a dropping hints and leaving openings!